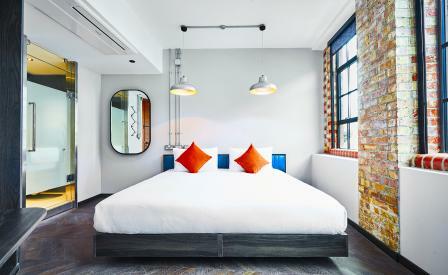 For the Malik brothers – Monsur, Masrur and Moksud – the opening of their New Road Hotel in London’s Whitechapel district is a full circle moment, their father having worked here when it was Service House, a textile factory. Almost 17 years after it closed, the Hume Victor Kerr-designed building has been rehabilitated into an 80-room boutique property. Designer Nigel Howard has retained the oversized windows, allowing light to flood the open-planned spaces still clad in their original exposed brickwork. The entry-level rooms, especially, are, to be frank, on the cosy side – the bed doubling as a sprawling divan by day – but the hotel’s MO is to lure guests out into the public spaces where vending machines dispense complimentary beverages, the rooftop studio offers outdoor yoga, and each floor features its own lobby lounge for convivial socialising and work. Meanwhile, Mr White’s Chophouse, Marco Pierre White’s new outpost, dishes a British surf and turf mix of smoked baby back BBQ ribs, grilled seafood, fish curry, and pork pie.